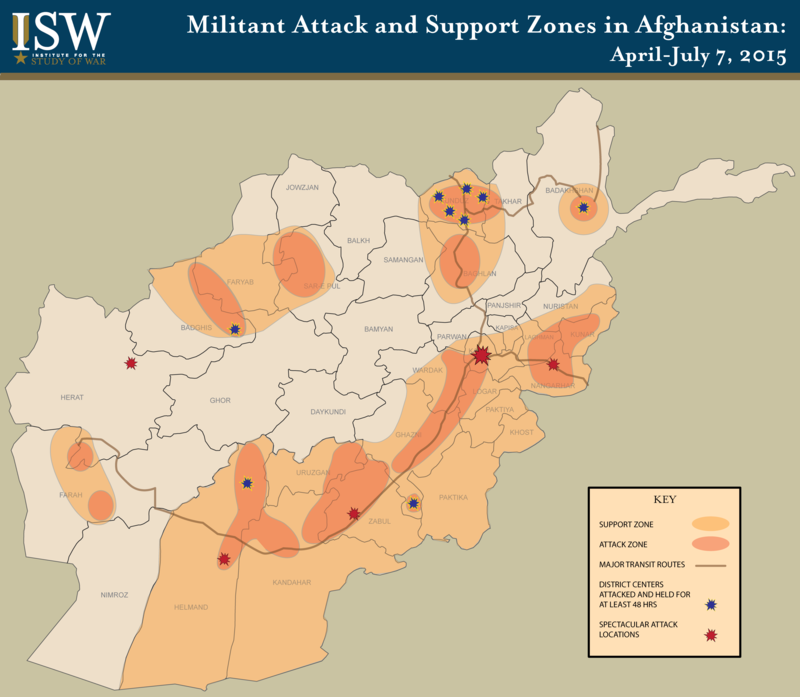 Security in Afghanistan has been deteriorating since U.S. force levels dropped from a high of 100,000 in 2011 to the current force size of 9,800 they reached in June 2014. The Afghanistan ORBAT (PDF) describes the location and area of responsibility of all American units in Afghanistan, down to the battalion level, updated as of March 2016. The success or failure of the U.S. mission in Afghanistan has reached a critical juncture. 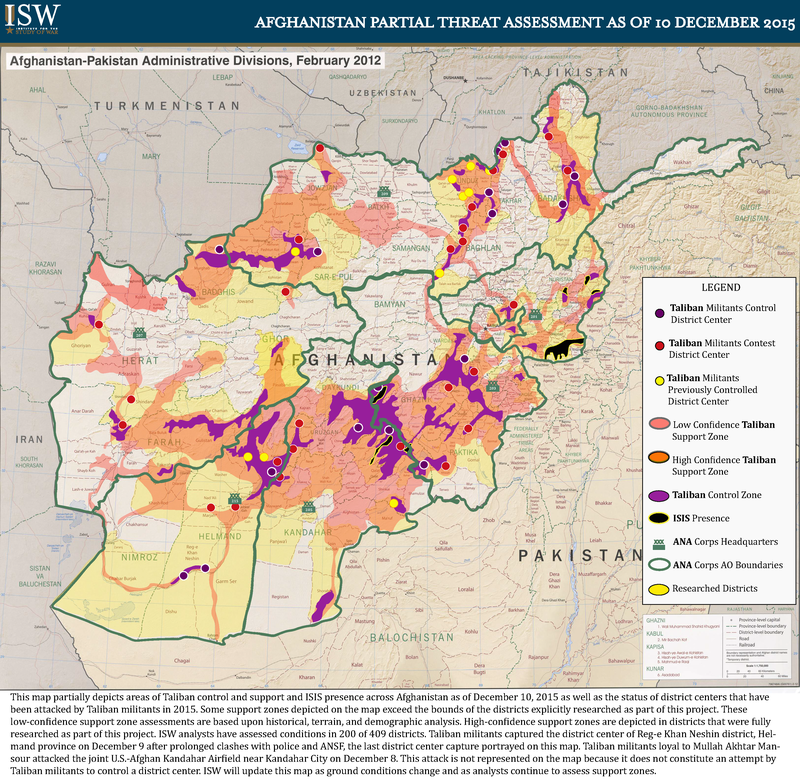 Newly appointed Defense Secretary Ashton Carter announced on February 21, 2015 that the U.S. is considering a number of changes to the U.S. mission in Afghanistan. This map depicts militant attack and support zones overlaid on a map with major transit routes with location for district centers and spectacular attacks. 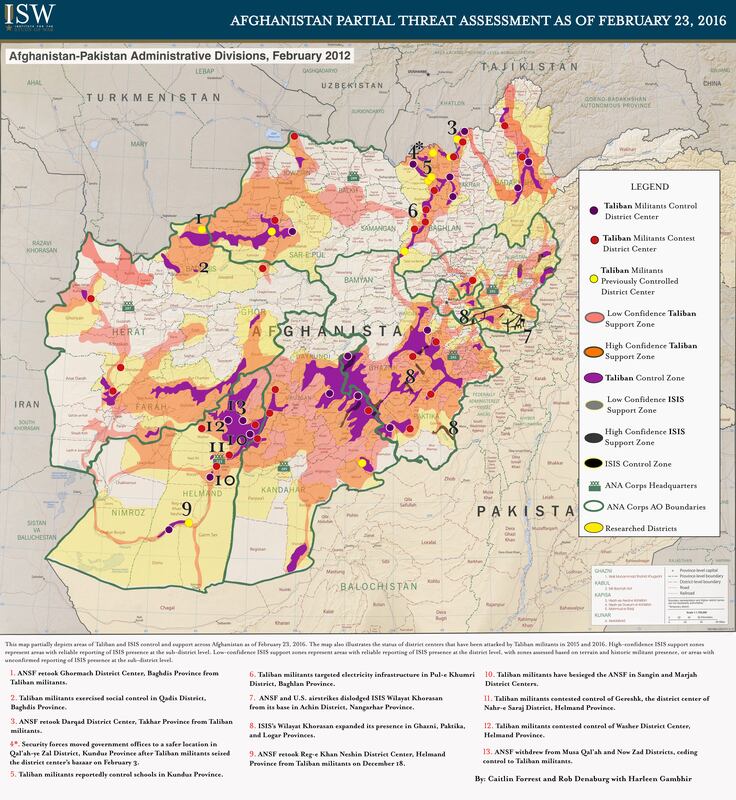 The Afghanistan Project at the Institute for the Study of War produces detailed publications on the changing security and political dynamics in Afghanistan. Research analysts document the pattern of enemy activity in Afghanistan and Pakistan; military operations by Coalition and Afghan forces; the implications of the drawdown of Surge forces; and the political, economic, and demographic dynamics underlying the conflict. The U.S. and Afghanistan have an opportunity to advance their strategic goal of negotiating an acceptable settlement with the Taliban. Large numbers of rank-and-file militants expressed their support for peace during unprecedented joint celebrations amidst a nationwide ceasefire for Eid al-Fitr on June 15 - 17. Partnership can indeed be a component of an effective strategy for countering terrorism. But partnership requires effective partners. This missing ingredient in Mr. Obama’s strategy will be its downfall. If America's experience in Iraq offers any single, unambiguous lesson, it is the folly of just walking away. The United States must not repeat this mistake in Afghanistan. Isolation and disengagement have severely damaged American credibility and security, as can be seen most dramatically in Ukraine today.